A Foggy Petronas FP1 with just 7km on the clock has sold for £31,275 at the Race Retro show at Stoneleigh Park, Warwickshire. 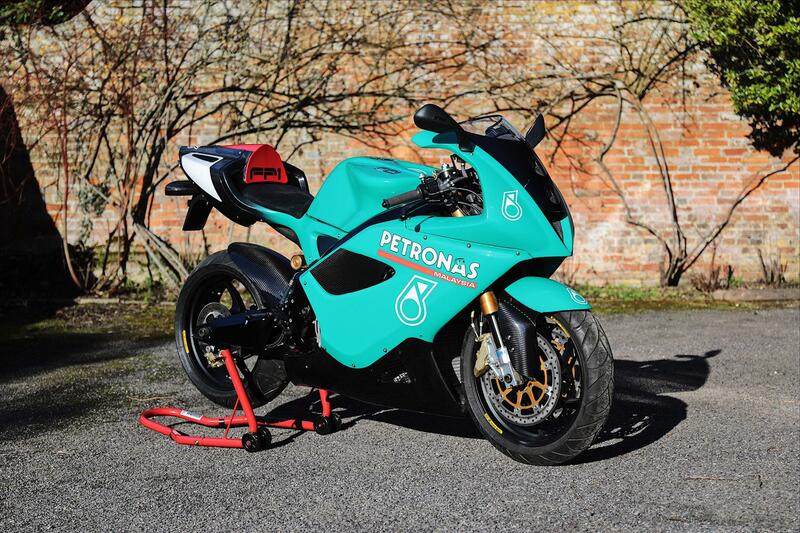 One of the road bikes manufactured for Petronas by Essex-based engineering firm, MSX International, the bike uses a Suter Racing 899.5cc four-stroke, triple engine that produces 127bhp at 10,000rpm and 67.9ftlbs of torque at 9700rpm. Rolling on Öhlins suspension, OZ Racing wheels, Brembo braking hardware and wrapped in full carbon fibre bodywork, this bike is fresh out of storage. It’s also recently been serviced and given fresh fluids and a battery safety check. The 2003 machine had been given a guide price of between £30,000 and £35,000 and is ready for road use (should the new owner want to ride it). But this might not be the only chance you'll get this year to lay your hands on an FP1. British race car firm, Lanzante, have acquired a batch of FP1s, and are meticulously recommissioning them for sale. They’re remaining tight-lipped about how many they have, and where they’ve come from, but claim they’re not part of the 129 bikes reputed to have been seized by the Malaysian government over unpaid taxes back in 2013. In 2010 MCN discovered 60 FP1s in a storage facility in Essex, and these – plus 69 more – were sold to Momoto, who rebranded them MM1 and planned to sell the lot, but they were seized and then embroiled in a series of law suits. Lanzante say the first units are being dispatched right now. Inside this week's new-look MCN: Foggy Petronas FP1 ridden on the road!